In his “Rhodes’ Reflections” column in the program book, SSO Music Director Kevin Rhodes noted that while “a musical evening in France was the idea behind” this closing concert of the SSO’s 72nd season, “recent world events in Paris” added poignancy to their performance on this program of Faure’s Requiem, in which the maestro found the same “religiosity” and “Gallic elegance” that Saint-Saens invoked on a much grander scale in his third symphony. In this quietest and most consoling of the great Requiems, Faure depicted death as “a reaching for eternal happiness, rather than a mournful passing.” The combined voices of the Springfield Symphony Chorus and the Pioneer Valley Symphony Chorus joined the orchestra in a warm, reverent account of the seven-movement piece, from the solemn opening “Introit and Kyrie” to the exhilarating “In Paradisum” finale. Soprano Dana Lynne Varga sang a radiant “Pie Jesu,” and baritone John Salvi was forceful in the “Offertorium” and “Libera Me” sections. Known as his “Organ Symphony” for the instrument prominently featured in the second and last of its four movements, Saint-Saens’ third symphony followed intermission in a sumptuous performance by the SSO and organist Griffin McMahon. Without pause after the dramatic opening movement, the organ enveloped the strings in a warm glow as they began playing the ravishing main theme of the slow second movement. 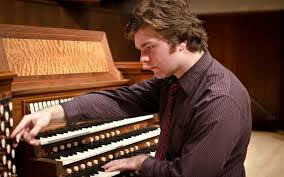 Again without pause after the fleet third movement, a thunderous solo organ chord introduced the majestic finale. Rhodes kept the organ in careful balance with the rest of Saint-Saens’ colorful orchestration, including a piano played by four hands in the last two movements. Longmeadow native McMahon was the star of the evening, also accompanying the orchestra and vocalists in the Faure and seated throughout the concert at an organ visibly positioned behind the violins at front stage left. His playing style was enthusiastic but modest, and as a 22-year-old Juilliard student with many New York performing credits on his growing resume, he looks to have a bright musical future. No orchestra could end a season more triumphantly than by showcasing local talent at a world-class level.